Last week, I wrote about how even in death, social stigmas are alive and well. Since writing that piece, I’ve seen how death and dying—one of the two existential givens of human existence—are ripe for stigmatization when something goes wrong, such as psychological distress, or a plague like this current Ebola crisis. Today I attended a conference at the United Nations entitled “Eradicating the Ebola Epidemic: Psychosocial Contributions to Combat Stigma and Promote Wellbeing, Mental Health and Resilience: Policies and Practices to Protect the Global Community.” While that title is quite a mouthful, every word has great significance. We have heard so much less in the news lately about the Ebola crisis because the Americans stricken with the disease have either been cured or died. And now that this nation is free of the illness again, it is back to being an “African” issue. Except it isn’t. It is a global issue. With healthcare workers from around the world working tirelessly in the stricken African nations, we all need to pay attention to what is happening there—not only for this crisis itself, but also for what it can teach us about how to handle future crises. Moderating the discussion was Corann Okorodudu, the chair of the Task Force on Ebola for the Psychology Coalition of NGOs at the United Nations as well as a professor of psychology and African Studies at Rowan University in New Jersey. She began the conference by reminding us that while the physical and medical aspects of the crisis were now under better control, the real work—the long-term work—needed to begin. This work was about restoring to afflicted people and communities a sense of security and identity, and a sense of community. It was about helping families figure out who they were now that they were missing key members and had lost key relationships. 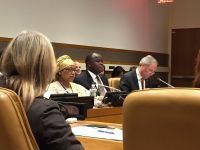 Jacob Kumaresan, executive director of the WHO Office at the United Nations, described the stories of survivors whom he encountered on visits to the afflicted nations. He said that many of the survivors now divide their lives into three distinct periods—before Ebola, during Ebola, and after Ebola. And what many find in the after Ebola period is stigmatization—children who won’t play with children who had a family member stricken with the disease or survivors forbidden from using the local wells for their water supply. Kintu Nyago, Uganda’s Deputy Permanent Representative to the U.N. further described how families lose their few possessions when they are evacuated for treatment, so the little they own—maybe a mattress and some clothing—are destroyed, creating even more poverty for an already impoverished society. But how do we make stigma go away? It’s very hard. Miriam Y. Vega, vice president of the Latino Commission on AIDS, compared the current Ebola crisis to the HIV/AIDS crisis. She noted that while global cases of HIV and AIDS are decreasing overall, the numbers are actually increasing in certain communities—because of stigmas. She links stigmas to such reasons as the need to conceal the disease or the need to conceal its origins, or because of its disruptiveness or even its danger to others. But whatever the reasons, stigmas cause people not to get tested, not to get treatment, not to disclose, and thus the disease runs rampant where the stigmas do. As I noted before, the title of the conference was very important, because policies and practices to help promote wellbeing and resilience can help combat both the stigma and the spread of the disease, as we can see with the HIV/AIDS model. Many panelists spoke about hearing survivors tell stories about wanting to help other survivors—not only because they wanted to help others but also to help themselves, to help restore their sense of identity and dignity. Creating a model where survivors are treated as heroes, as spokespeople, as advocates for healing can help others see that they are no longer “tainted.” Others spoke about Time Magazine’s wisdom in making the Ebola healthcare workers the magazine’s People of the Year—by honoring them rather than shunning them, we encourage more people to serve and remember that this is a long-term operation. Most important, however, is the word “global.” As existential practitioners, we toss around the idea of relationship and interconnectedness like leaves in a salad bowl. But what does it really mean to be truly interconnected? To really honor that we are Beings-in-the-World? By recognizing that we all have a part to play in any world crisis—that just because we are separated by miles does not mean we cannot have a positive impact. There were points during this meeting where I felt that the problem was too great, too unsolvable, for a few people in a small conference in a city along a river. But the more I listened to their commitment and to their dedication, I was reminded that we all touch one another in big and small ways each day. So who is to say that we cannot solve this great problem if we all come together—and I do mean all. For the sake of our existence.